WHERE: Shops & Galleries on Public Square, Strawberry Alley, & Franklin St. The July Art Walk will be held July 7th from 5:00 to 8:00 pm at the shops and galleries on Public Square, Franklin Street, and Strawberry Alley. The participating businesses are listed below as well as a description of the work they will be exhibiting and services they will be offering during the event. Join us for the July First Thursday Art Walk and enjoy free admission! This gathering of 19th century paintings by William Stamms Schackelford showcases his unique depictions of various people, including portraits of the Clarksville Shackelford family. Sponsored in part by Tennessee State Museum and Austin Peay Department of Art & Design. Tennessee artist Carol LeBaron’s fine art textiles transform remembered light to imagery, collecting fragments from both the landscape of her remembered experience and observation of natural forms. This series of plein air paintings by Larry Richardson explore the Cumberland River. Sponsored in part by Legends Bank. Take a closer look at the life of Clarksvillian Cave Johnson. Johnson was elected to the U.S. House of Representatives in 1828, and later served as president of the Bank of Tennessee from 1854 to 1860. He was also a close friend and advisor to James K. Polk during his successful presidential campaign. Kentucky artist Amy Chase’s ceramic work focuses on representing personal relationships, memories or situations of her experiences. The surfaces consist of intricate patterns that are applied using precise silkscreened slip and glazing techniques. This exhibit explores the theme of hunting, fishing, and other outdoor leisure activities in the area with objects from the Customs House Museum & Cultural Center’s permanent collection. Edward’s Steakhouse is proud to feature local photographer, David Smith, during the July First Thursday Art Walk. He is a member of The Friends of Photography here in Clarksville. His photographs have been displayed in Edward’s Steakhouse, Tennessee State Museum, Customs House Museum and F&M Bank in Clarksville and Springfield and has been featured on local program, Tennessee Crossroads. Stop in, see the art, listen to Jackson Miller, live, on the piano and enjoy the Thursday night special, 1/2 priced $7.00 appetizers and 2 for 1 draft drink specials. The Roxy Regional Theatre’s Peg Harvill Gallery is proud to feature the art of local artist, Mike Fink, during the July First Thursday Art Walk in conjunction with the current production of The Awesome 80’s Prom. Due to a performance that evening, the gallery will only be open from 5pm to 6:30pm. For tickets to and information about our current production, The Awesome 80’s Prom, please visit www.roxyregionaltheatre.org or call the box office at 931.645.7699. DAC’s 1st Annual T-Shirt Design Contest and Exhibition! Downtown Artists Co-op (DAC) is excited to announce something different this July! This summer of 2016, DAC is celebrating the humble, but always popular, T-Shirt. We asked area artists to design the front of our new T-Shirt; the goal was celebrating the creative life and representing the ever-growing Clarksville arts scene and our diverse, talented local artists. In addition this month, DAC will have all new works from our members on our “retail side” (to the left). This fun, summertime opening reception will be on Thursday, July 7th from 5-8 PM. DAC chose to create a black T-Shirt, with the winning logo (in white) on the front. We asked for edgy, out-of-the-box designs that kept with our theme. Sixteen designs were submitted and a single design was chosen by a group of three jurors. The winning design was sent to IMF Printing, with only our jurors knowing the winner. The winner will announced at the DAC during First Thursday Art Walk at 6PM. The winning T-Shirt design will be for sale in a variety of sizes for purchase all year at the DAC. All proceeds go towards supporting the DAC and towards our mission of supporting Clarksville’s Visual Arts… plus prize $$$ to the winning designer! Who will it be? How cool will the T-Shirt design be? You gotta come see! All the design submissions will be displayed too. Along with our T-Shirt design contest, our members and others have submitted T-Shirts to exhibit in our main gallery this month. Each participating artist has submitted T-Shirt(s) that mean something to them. This is a special exhibit. You’ll be delighted and moved to see the designs and some of the stories behind each T-Shirt on display. 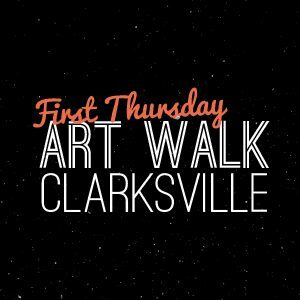 The DAC will be serving up yummy appetizers and sweet beverages during the opening reception, always a central part of Clarksville’s monthly First Thursday Art Walk. A wonderful evening of art, music and more awaits all who come to downtown Clarksville for First Thursday. What could be better on July 7th? Quality arts, good times and good friends will be waiting for all who come out for this fantastic exhibit and all the other exhibits around town. Hope you can come out, meet the artists and just enjoy a fun night at the DAC and First Thursday Art Walk. Current exhibits will be on display the entire month of July. The DAC Gallery is located at 96 Franklin Street, in Downtown Clarksville, TN. DAC will be open Noon-4pm, Wed.- Fri. and 9am-5pm on Sat. See our website at www.downtownartistsco-op.com or visit us on Facebook for more information. DAC thanks IMF Printing, The Framemaker and Sango Liquors for sponsoring this month’s exhibit. The Framemaker proudly presents artwork by Tori Felton. This exhibit is part of Clarksville’s First Thursday Art Walk on July 7, 2016. An opening reception will be held from 5 p.m. to 8 p.m. The exhibit will remain on display at the Framemaker throughout the month of July during normal business hours (Mon. through Fri. 10 a.m. – 5 p.m.). Stuart Bonnington returns to the College Coffee Co. performing songs from the British Invasion from 6-8pm during the July First Thursday Art Walk. Rogate’s Boutique will not feature an artist during the July First Thursday Art Walk, but will be open for business until 7pm. Stop in and find a few new pieces to welcome summer into your wardrobe! Hops Road, located on Strawberry Alley in Historic Downtown Clarksville, is proud to support the July First Thursday Art Walk. Stop in, grab a bit to eat and check out some of the great local artists that Clarksville has to offer. Hops Java & Juice is proud to support the July First Thursday Art Walk. Stop in and enjoy the artwork displayed throughout the shop, pick up locally sourced products and food and grab a cup of coffee as you enjoy the July First Thursday Art Walk! Mildred and Mable’s will stay open late during the July First Thursday Art Walk. Stop in and check out all of the great gift and clothing options offered in Historic Downtown Clarksville. Couture Crush is proud to support the July First Thursday Art Walk and will stay open late that evening. Find some new additions for your Summer wardrobe during the July First Thursday Art Walk!